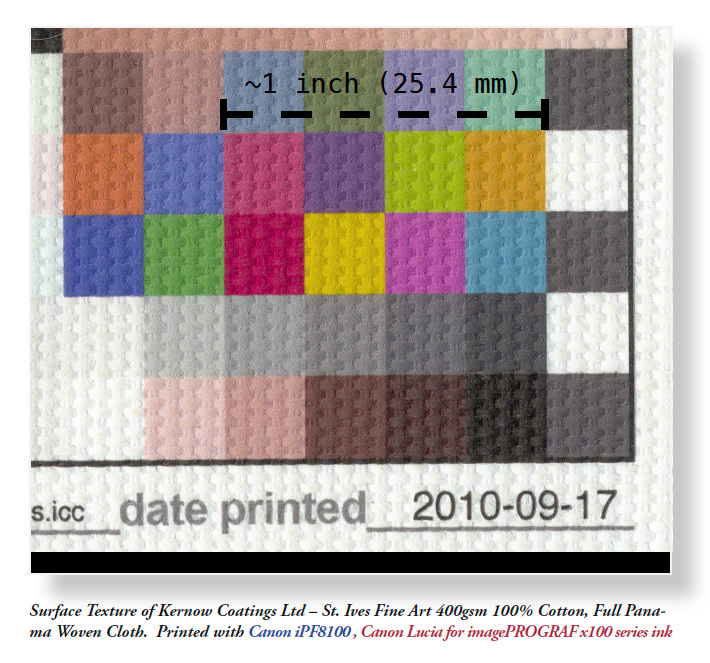 Kernow Coatings Ltd has recently introduced a new line of inkjet printable fabrics. There are currently five distinctive weave patterns in the Kernewek range of Fine Fabrics – St Ives, Tintagel, Marazion, Newlyn, and Tresco Design. Filter the AaI&A lightfastness test results database on [paper/media] [contains] “Kernow” to quickly locate the test results. To date, the testing has reached the 30 Megalux hour exposure mark in test. 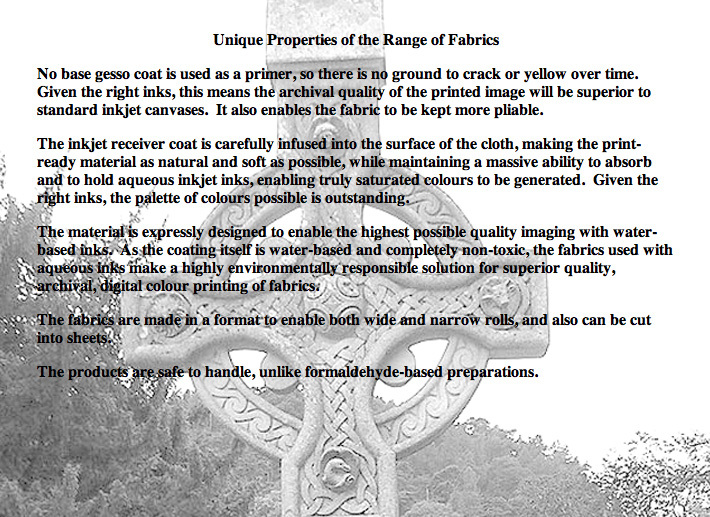 This description of the Kernewek line of fabrics was provided by Kernow Coatings Ltd. The Kernewek line of inkjet printable fabrics can be purchased from Hawk Mountain Papers in the United States. Please contact Kernow Coatings Ltd for availability in Europe and elsewhere. As our digital print research program has grown, AaI&A has begun to receive more inquiries from vendors about how they can ensure their products are included in the AaI&A database. We are pleased to work directly with manufacturers and distributors. Our policy for “fee-for-service” testing is straight-forward. The vendor provides the materials and pays the conventional engineering rates needed to cover the cost of the requested tests. In this way AaI&A member donations and funds contributed by our sponsors are exclusively reserved for artist/printmaker-submitted sample testing only. Contracted testing can be kept totally confidential, or the vendor can request that the results be added to the lightfastness database at any time. AaI&A does not charge any additional licensing fees or “certify” product performance which can lead to potential conflicts of interest. AaI&A also retains the copyright to all reports which ensures that the published results are always viewed in context with all other test results in the Aardenburg database. The vendor also agrees that if the tested material is commercially available, any AaI&A member also has a right to request testing of the product at any time. Artist/printmaker-submitted tests will always be posted for the AaI&A membership regardless of any similar testing held confidential by the manufacturer. AaI&A’s approach to fee-for-service testing is undoubtedly not to every manufacturer’s liking, but companies with good products will welcome our cost-effective and truly independent test results. I am pleased to announce that Kernow Coatings Ltd is the first manufacturer to use AaI&A contracted testing services and to confidently make the test results publicly available on our website. The testing of the Kernowek line of Fine Fabrics shows how AaI&A can successfully work with manufacturers while retaining complete independence in our digital print research collaboration with artists and printmakers worldwide.